We treat your pet like family because Blais Veterinary Cares! Dr. Blais is our Veterinarian and has been caring for pets for over 30 years. His knowledge and compassion of helping pets is his #1 priority. Educating clients is his goal to help keep pets safe and healthy. 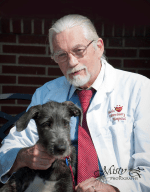 Douglas R. Blais VMD CVA CVH, has cared for Indiana County animals for over 30 years. Dr. Blais offers the best of both worlds for the care of your pet by combining eastern and western veterinary medicine at our facility. He offers a holistic approach through certified veterinary acupuncture and herbal remedies for pet ailments and behaviors, too. Member of AVMA and Traditional Chinese Veterinary Medicine. Enjoys skiing, hiking, and reading. Years in Practice: 33. Education: Graduated from Penn State in 1972, receiving a Bachelor of Science Degree in Animal Science. Graduated from the University of Pennsylvania in 1976, receiving a Veterinary Medical Doctor Degree. Graduated in March 2012, from the Chi Institute of Traditional Chinese Veterinary Medicine, receiving his Certification as a Certified Veterinary Acupuncturist to treat small animals and horses. Specializes in Chinese Herbal Medications.